The 9.2 channel Denon AVR-X4500H 4K AV receiver, available in Winnipeg from Creative Audio, supports Dolby Atmos, DTS:X and Auro-3D for an immersive home theater experience. The advanced HDMI section of the Denon AVR-X4500H (8 in, 3 out) features the latest video technologies, including Dolby Vision, HDR10, HLG, 4K video upscaling and HDCP 2.2 processing on all ports. Stream music from Spotify, Pandora, Tidal and more with AirPlay2 and HEOS built-in; control your home theater and music services with your voice through Amazon Alexa. Ideal for custom integrations, the AVR-X4500H features “ihiji Invision” and “Domotz Pro” remote system monitoring and management technology, plus an award-winning Setup Assistant for a seamless out-of-box experience. Featuring discrete high-current amplifiers on all channels, the Denon AVR-X4500 delivers high-power performance at 125 watts per channel (8 ohms, THD 0.05%, 20Hz~20kHz). Low impedance drivers provide operational stability for a wide range of speakers and create a balanced, tonal sound. The Denon AVR-X4500H features three-dimensional sound formats Dolby Atmos, DTS:X, DTS Virtual:X and Auro-3D, plus an HDMI section with HDCP 2.2 support and advanced video processing with 4K scaling for HDMI sources and two 12V trigger outputs to connect external devices. 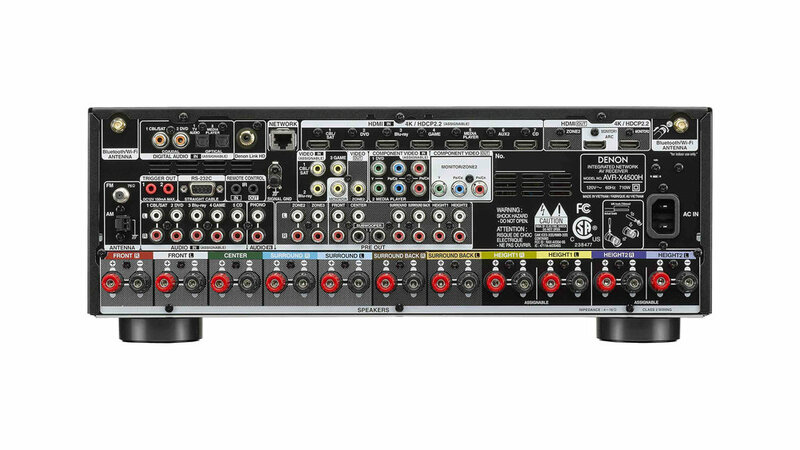 Are you interested in the Denon AVR-X4500H? Thank you for your interest in the Denon AVR-X4500H! One of our team will be in touch with you very soon.